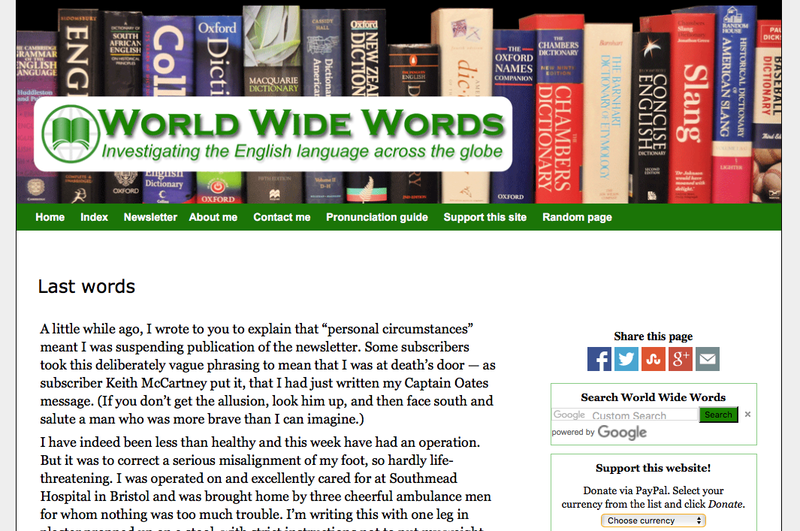 A month or so ago Michael Quinion, the founder and writer of the wonderful World Wide Words website, sent out a message to the 50,000+ subscribers to his free newsletter that he was suspending publication his newsletter, citing ‘personal circumstances’. It would seem that I was not the only person who took this as meaning that he was facing serious illness. This has almost nothing to do with my decision to cease writing World Wide Words. Truth be told, after 930 issues I was becoming written out. Every week that passed made writing more of a chore and less of a pleasure. About a year ago, closure of the freelance reading programme of the Oxford English Dictionary, to which I had contributed since 1992, meant that I had lost a key stimulus for investigating and writing about new words and — more recently — access to the online OED. Cuts to local authority library services have very recently severed access to a key British Library newspaper database. I began to think that somebody was trying to tell me it was time to stop. Those of us who toil in the back reaches of the interwebnet should salute Michael Quinion and thank him for the twenty years of wisdom and wit he has regularly dispatched to so many people. Good luck in the future. The project he is now taking on – the conservation, documentation and move of a recently closed local railway history museum – is surely in the safest of hands.